The parade was started in 1982 by Glenn Terry and the late Bill Dobson as a parody of the annual King Orange Jamboree Parade for the Orange Bowl. After a group of Grove residents, known as the "Mango Marching Band" were denied entry into the Orange Bowl parade due to "unsuitable instruments" such as kazoos and conch shells, they decided to create their own parade. And they said it wouldn’t last!!! What started as a rejected group from the King Orange Bowl Parade has grown into the wackiest event in south Florida (not counting the elections). I also note that the King Orange Bowl Parade doesn't exist anymore. A warning on their web site says it all. "Warning this parade may contain nuts!" So they created the Weirdest Parade in the Universe which in the past had The Marching Freds, The Synchronize Briefcase Brigade, The Booger King, The Million Chad March, The League of Dead Voters, Cuban Eye for the Gringo Guy, Idu Grab Prison, Weapons of Mass Distraction, Osama Piñata, The Hare Krishnas and the Running of the Bullshitters. This year's parade is strutting for the 30th time!!! 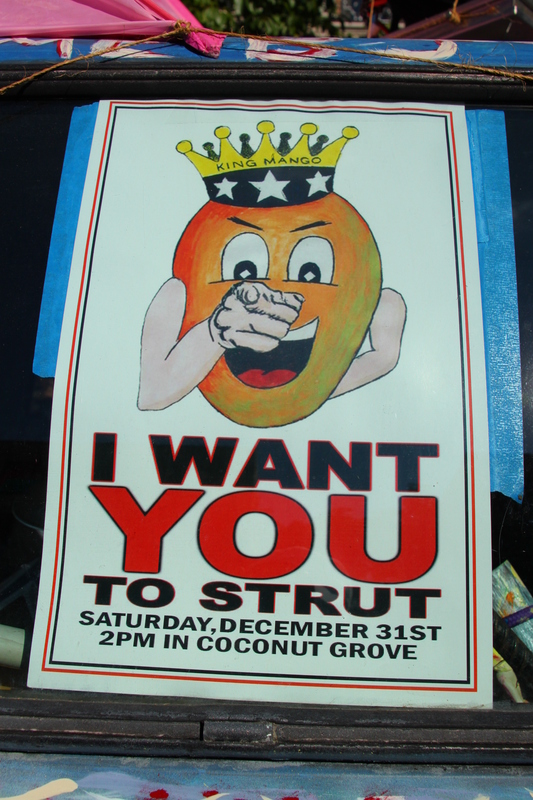 When in Florida at this time of year for me The King Mango Strut is the most fun event Miami has to offer, full of irreverent, creative and wacky people and lots of opportunity to make fun of everything and anything. There is no better place for the strut than in Miami, Floriduh. It provides more material than the strutters can ever use. As creative as they are, even they couldn’t come up with some of this stuff! The spirit of the King Mango Strut is significantly tongue-in-cheek. Participants are willing to poke fun at anything and everything. Most of the parade consists of satire of events that have happened in the last year, from world events to state to local. Nothing is off-limits, and the boundaries of good taste are often pushed or broken in the name of irreverent comedy. For example, co-founder Bill Dobson died from cancer in October 2004, but made an appearance in the 2004 Mango Strut, in the form of an urn, with ashes being strewn along the parade route. A group followed with brooms and vacuums followed, trying to "get Bill out of the road." Organizers do have some humility, however; the ashes were not actually Bill's remains but regular fireplace ash mixed with kitty litter. However, a sign rode along with Bill's urn, proclaiming "Hey, I may be dead, but I can still vote in Miami." In November 2006, the strut decided to put its Grand Marshall title, formerly held by such notables as Janet Reno, up for bid on eBay. As of November 17 that year, the bidding had climbed to $5,000. Your historical note for today. If you have ever visited Miami and looked out to sea you might see a light house at the southeastern tip of Key Biscayne. It was a setting of high drama during the Second Seminole War when Indians attack it. They set fire to the door which ignited an interior oil tank, assistant lighthouse keeper John Thompson and a helper named Henry climbed to the top with a musket and a keg of gunpowder. The fire forced the men onto the outside platform at the top where Henry was killed by gunshot. Thompson, choosing suicide, threw the powder keg down the shaft into the fire. The explosion did not kill him, but it was heard twelve miles away by a US. Navy ship, which sailed to the site and rescued the beleaguered keeper. This is only half the story. For the evenings story and New Years go to the next listing.